a novice gardener, originally uploaded by gilfling. The last few weeks (crooked back aside) I have been spending lots of time in the garden, pottering around, planting seedlings and trying to learn the basics of creating a small vegetable plot in such a tiny space. I have bought a couple of books from charity stores and a couple of new books and when not working you can find my nose buried in one of these trying to learn all I can in order to create some produce for ourselves. This is only the second garden I have had as a grown up and the last one was even smaller than the tiny space we have now – well established, it required little more than the odd bit of weeding and cutting back. Now however we live in a brand new build house and so literally I have had to start from scratch. Also we are renting and on a very small budget so there is not much in the kitty for making any substantial changes as yet, nonetheless I am making a new discovery about myself, which is that I LOVE gardening!! I might only be the most novice of novices, but I love getting my hands dirty, I love pottering and I love seeing the progression of a pot of nothing but earth turning into bright green seedlings and hopefully if I have got the alchemy right, eventually some edible veg! We have had weeks of sunshine here in the UK and I treated myself to a very cheap plastic greenhouse in which I have been starting things off. It feels a lot like art and crafting, this creating something from nothing, the time pondering and pottering and the slow wait for results and I guess that is why I am so drawn to it. Most things I am growing in pots as the earth is so poor here with it being a new house but I am slowly learning what I can do in the future to help it along. I bought a brilliant book The Thrifty Gardener by Alys Fowler and I am learning that I will be able to plant crops that will grow quickly and then can be dug back into the earth to help condition it so I hope to do that soon so that I can begin growing things in the ground too. 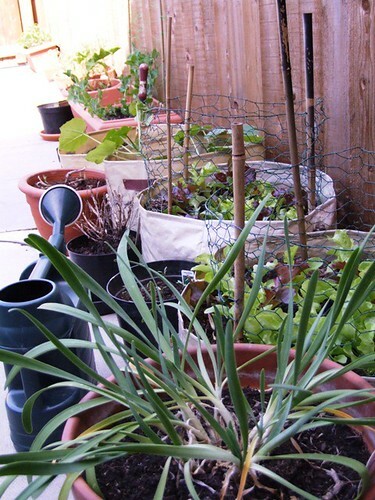 In the next couple of weeks I hope to build a composter and although we have no drain pipe down the side of the house (we live in a terrace and our neighbours have them but somehow our house has been missed out) I hope to find a solution to the dilemma of how to collect water. The garden may not be pretty, with its parched lawn, empty half dug beds, the line of a rather mixed collection of wonderfully aged pots, ugly plastic ones and even uglier plastic containers but I am rather proud of how it is developing. I am growing tomatoes, courgettes, peas, runner beans, cucumbers, lettuce, beetroot, salad onions, peppers, and lots and lots of herbs. Not bad for such a small space! In amongst this practical plot which will hopefully save us some pennies on our grocery shopping, there are pockets of soon to be loveliness in the form of honeysuckle, hollyhocks, sweet peas, cornflowers and poppies and I can’t wait to see them begin to appear. 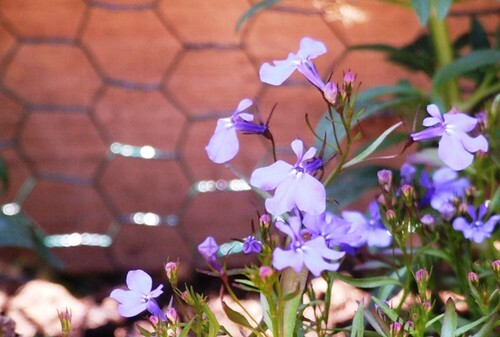 Anyway thank you for indulging me wittering on about my new love – Mark is definitely NOT a gardener and I fear that I bore him rigid with my endless updates on what seedlings are making an appearance and dilemma’s on what to plant where and what is working and not working! In the photo at the top you might also be able to see the fortifications I have had to put in place to stop the bunnies from using the pots as an assault course and their own personal dining area! It is a constant battle as they do like to try a bit of everything and the sweet peas I planted in the ground the other day might not survive the trampling they have been suffering the last couple of days. The dudes, originally uploaded by gilfling. Jeeves and Wooster enjoying the gorgeous weather we are having here in the UK with more to come over this bank holiday weekend. Jeeves seems to have made a great recovery after we almost lost him last weekend and we are so grateful to still see him galloping around the garden and even using my vegetable pots as some kind of private eatery. Friday, Friday and in this work that I love so much Friday does not signal the end of the week for me. My days are different at the moment as I am still moderating my hours to allow for recovery time and so my working hours are short and I am allowing myself even more time than is usual to just dream and let my thoughts drift. I spent rather too long in the studio yesterday just sketching and enjoying the company of Jeeves and Wooster but it has left me a little tired today. I also stayed up far too late last night tip-tapping on my computer for an exciting bit of news which I will be able to reveal in good time. So today I shall take it a little easier and will look forward to getting into my studio a little more over the weekend. 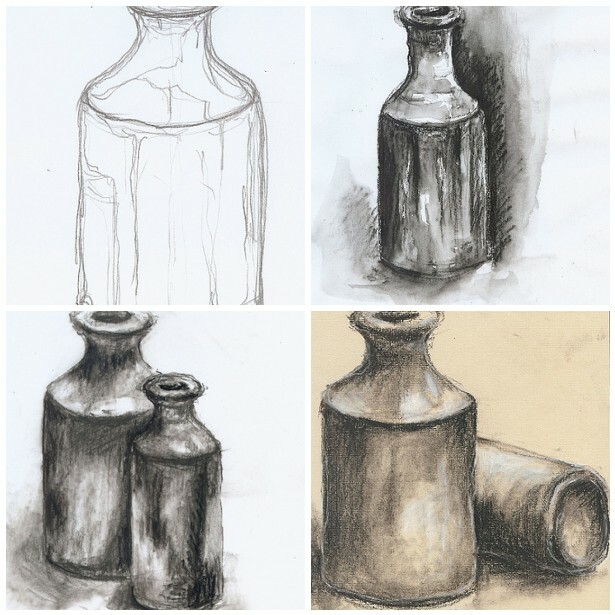 I have been continuing to work on the coursework for Stretching Within – one of the tasks being to draw the same object every day for the duration of the course. This will be an interesting experience! I chose a collection of old pottery ink bottles and already I am finding myself increasingly aware of the textures and imperfections in their shape. I have always loved them of course but they are there in my studio every day on the windowsill and after a while I have stopped ‘seeing’ them. I have started with basic pencil and charcoal drawings, observational and true to life (although those blinking ellipses always fox me) so it will be interesting to see how these will develop and how I can make the drawings more interesting. You will be able to view the collection here. Wishing you a wonderful weekend whatever you may be doing. Jeeves and Wooster, originally uploaded by gilfling. I am hoping to resume normal service soon….but they are kind of cute….no? Bunny proofed fence, originally uploaded by gilfling. The sun has barely stopped shining here this weekend and as a pale as milk scottish lass I should stay out of the sun, but the new garden-lover in me cannot say no to spending as much time outside as possible (with a big sunhat and layers of sunscreen of course). We were on a mission at the weekend and the hot sun meant trials were ahead but when needs must…. 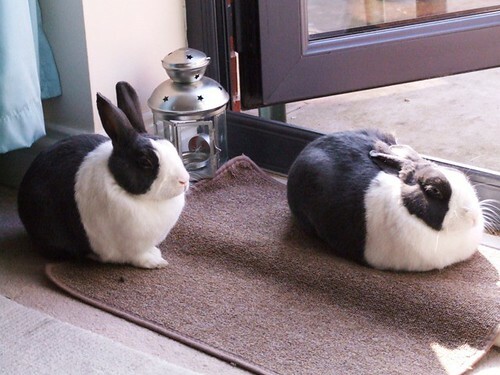 Our two bunnies, Jeeves and Wooster have very different characters and Jeeves has taken to trying all manner of escapades in a bid for freedom. However we love the fact that they can lollop freely around our tiny garden (with supervision) but pop into the loo or for a drink and within 10 seconds he can burrow his way out under the fence with Wooster either oblivious or looking on with envy at his brothers bravery. Not so bad if it is just out into the next garden but potentially catastrophic if he made it out to the car park and beyond – we would never see him again….. So the plan this weekend was to tackle some serious bunnyproofing. Lots of digging, lots of wire clipping and pinning and then putting the dirt and gravel back where it belongs. Not exactly the best task for what I think may have been the hottest weekend of the year so far but absolutely necessary. We are still only a third of the way through but have so far tackled his favourite spots and hope to finish next weekend. So this was our Saturday and Sunday. Busy, tiring and requiring plenty of stops for refreshments and to let the muscles and back ease up. Hard work but so much cheaper than a bought bunny run and they get to lollop about in a larger space which they do love. They are like streaks of lightning when they really run about and love jumping 2 foot into the air in absolute joy – we don’t want to hinder that with a bunny run! We also made it to the local market – the first time since we have moved here! Why it took us so long I do not know but shopping for fruit and veg in the outdoors beats supermarket rushes hands down. Mark even gifted me with some bedding plants for the garden and it is glorious to sit out there and have some colour along with the bees that are attracted to them. In our brand new house, our garden is also a blank canvas and this can be a little overwhelming at times, especially when I desire instant overgrown wilderness and layers of colour and texture. But little by little we will add a plant at a time and wait for that character and seclusion that I seek in this tiny little space…. leatherwork closeup, originally uploaded by gilfling. Today is a ‘mosying’ about kind of a day. Catching up on little computer jobs that have been residing on the ‘to do list’ for a little longer than they should; drinking mugs of coffee whilst they are still hot; sitting with feet up and doors to the outside world open. The sun is shining and the spring coolness just means an extra cardy to allow me to enjoy the air. The photo above is a recently completed commission with a very specific brief. 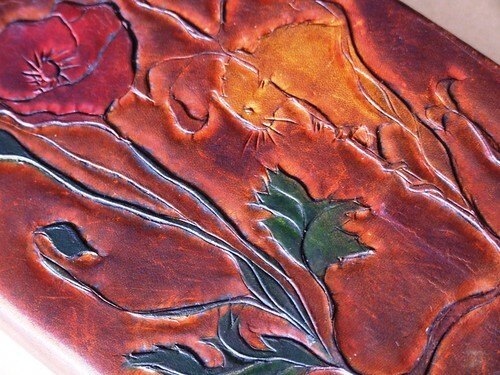 A hand carved book cover with field mouse and poppies and the final piece to look like it has been re-discovered after decades sitting on a hidden shelf. I do struggle with commissions as often my nerves get the best of me and the self imposed pressure to make the perfect item for the customer can be paralysing (does anyone else suffer from this?) It is however also a challenge that is good to go through as quite often it means I am working on something which is outside my comfort zone and normal way of working. So here after many sketches I came up with this design and tooled the leather, hand-dying it to create an uneven aged patina with a bit of extra ‘weathering’ applied to the edges to add extra character. One of the most difficult parts was to remove the cover of the original book as I have only previously bound books from scratch and have not had the experience of working on an old book before. With the aging of the leather and the end papers now a lovely hand made paper the book takes on a different character and I am pleased (and relieved) with the final piece. I love the tactile nature of working with leather and it is something that I do not get to do that often, but the process of recovering this book has made me wonder about incorporating these skills into my own more personal work – we shall see…. 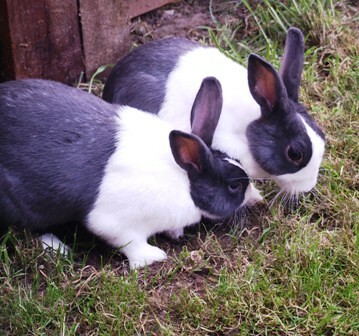 So we have a ‘homely’ weekend to look forward with two new members to the household – Jeeves and Wooster, our rescue bunnies who are settling in nicely. I shall be trying not to be too much of an over-clucky mother hen and weather permitting enjoy some time in the garden. Have a great weekend!